The Target cashier teased me last night that she's seen me every day that she worked this week! It's true. Between the Summer Clearance and other great deals posted at Totally Target, I have been scouting the store everyday. Like a hawk hungry for savings. I have been waiting and waiting for the 70% Off Toy Clearance. My store had the 30% sign-up BUT I did find some at 70% off. Check out this Monsuno 8-piece toy. It was $27.99 marked down to $8.38, as most of the other Monsuno toys were also 70% clearance! Yay! One more for the gift closet. Target Clearance: 70% off shoes!!! Not just summer shoes, but lots of random kinds for the whole family (ladies' boots, espadrilles, tennis shoes, dress shoes and more!). I picked up summer sandals and slip-ons for less than $5 for our girl. And these CG shoes were only $7.48, originally $24.99 and a size 3.5, perfect for back-to-school. Everyone wants a piece of the pie. Now we all can get pie for FREE at O'Charley's. But only on Wednesdays. If you're good. Okay, even if you're not good. But try to be, anyway. We went to O'Charley's last week while the kids were at VBS. We brought a coupon (of course!) for $10 off $30. BUT, we were told that either we get free pie, or we use the coupon. Both offers could not be combined. So I thought we could just share one meal. Even though we only split one 9.99 meal, they still gave us 2 pies slices! I thought we would only get one to share. So for less than $10, we had a nice meal, all the yummy yeast rolls we could eat, and a pecan and peach pie with whip cream. Yum! The CVS batteries I found were 10-pk + 2 bonus batteries. The price tag said 2/$6.00 or $6.79 each. CVS Batteries are BOGO this week. So, even if one pack is free, the other rang up $6.00! We've used this brand before and they work great. =$0.30 per battery and $0.07 per lotion! This post is linked to Menu Plans at orgjunkie. Happy Monday! Last week was a blur at mealtimes. The children were at VBS in a church far from our house so we ended up eating out a couple of times like our free Cow Appreciation Day dinner. And since we were having so much fun with our impromptu dinner dates, the menu plan kind of fell by the wayside. This week, I hope we stick more to eating at home. My tummy is still upset at the wonderful-now-awful-later feeling of eating more than one Krispy Kreme donuts. Buy 3 Garnier Fructis Select Stylers, Get $5 GC = $0.83 each with $1 here or here. Plus more First Aid deals at Totally Target! 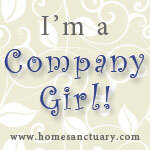 I get my Target deals from Totally Target, Hip2Save and the linky parties at Money Saving Mom. My neighbor planted dozens of daylilies. They bloom beautifully all summer long. When we read the book, My Side of the Mountain, the main character is a boy who runs away from home to live in the woods for a year. Daylilies were one of the plants he ate. I thought it would be fun to try and looked up some recipes. Plenty say the petals make a fine addition to salads. The day-old flowers can also be used for stirfrys. And the buds can be sautéed and taste like asparagus. Hunt. Gather. Cook author Hank Shaw prepared daylily buds, flowers and tubers. I really enjoyed the breakdown he gives for the preparation and taste of each part of the plant. I do love plants but hate bugs, so cooking the buds was the most appealing. Poor man's asparagus is another name some use for daylily buds. The bud is tightly closed, so bugs shouldn't get inside. I picked one bud and cooked it in a little oil. I tasted it and surprise! It tastes like asparagus!!! The children and I collected about a cup of buds. It's near the end of the season but there were still plenty of buds left. I washed them well. Then I minced about a tablespoon of ginger and mint. I figured ginger should alleviate any side effects from eating these flowers. Ginger is antibacterial, antiviral and antifungal and anti-nausea. I sautéed the ginger and mint a few minutes then added the daylily buds and seasoned with salt and Old Bay. Voila! Poor Man's Asparagus! Even my husband said they were good. I think I'll plant some daylilies too and enjoy this seasonal treat! Word of Caution: I only know that the regular ORANGE daylilies are safe to eat. So I would NOT try hybrids like these below, especially not the YELLOW daylilies. This one is mostly yellow with some orange. Farm Fresh Double Coupons Up to $2 Sunday-Tuesday! Sunday-Tuesday, Farm Fresh will double ALL manufacturer coupons up to $2! Up to 20 coupons doubled per customer, per day. Limit one coupon per item. Maximum of two like items/coupons per shopping visit. Excludes coupons that state 'do not double and triple'. Visit Farm Fresh to view their weekly ad. If you are there Sunday, pick up a dozen large eggs for only $0.88, limit 1. We love Krispy Kreme around here. Even better when there's a deal! 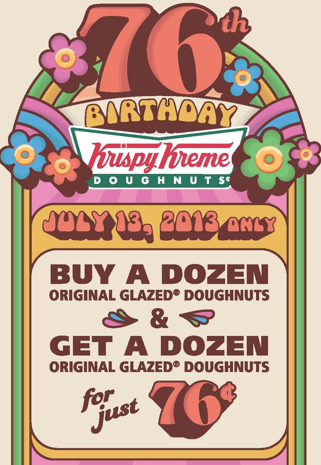 Buy one dozen glazed, get a second dozen for only $0.76, today only. Go out with friends and enjoy this deal. Share the love. Southern Savers, Hip2Save and Money Saving Mom (and linky party). Also, I Heart CVS has early ad scans and plenty of great info in the comments section! Check the Magic Coupon Machine for possible coupon for $3 off $15 purchase. Many coupons that print from the Magic Coupon Machine can also be printed online from your CVS Account. Most don't limit how many can be used in a transaction. For example, I got $2 off Nature's Bounty vitamins. The deal this week is BOGO Nature's Bounty, I can use two $2 off CVS coupons from my Extracare account. 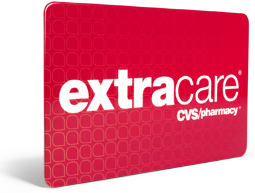 CVS $3 off $15 Coupon! My favorite deals are posted here. Check the back page of your CVS weekly ad! Some areas are getting $3/$15 coupons from the Magic Coupon Machine. So far, I saw this in the Richmond VA and Baltimore MD weekly ads. It seems very regional, but hurray for those who get it. For some reason, I have not been receiving and email coupon for two weeks now. I am definitely psyched that we're getting this $3 off $15 coupon in our area! Other areas are getting $0.75 off Mars single bars. And for those who still get email coupons, what value are you guys getting. Many are reporting getting 20% off coupons! Thanks, Wild For CVS! I stayed up last night watching High Noon with Gary Cooper and Grace Kelly while stitching up a couple dozen black and white cow spots on shirts and pants. I didn't want them to come off so easily because I was hoping to visit a couple of Chick-Fil-A restaurants today for Cow Appreciation Day. We ended up stopping by two and we had a blast! The first stop was our neighborhood restaurant. They had very few restrictions on the free meals. I got a chicken wrap and fruit cup. The children got 4-pc chicken strips. Tony ordered a chicken deluxe sandwich. There was only a group of highschoolers in front of us and they had their order right away. This restaurant was very prepared! Later, we went to a second location that was in a strip mall. I thought it would have less people than our stand-alone neighborhood joint. Instead there was a long line. And a few people were not dressed up at all. Some customers were sharing their black cow dots and ears with them after they placed their orders. It was a picture of community. See, nothing brings people together like food, especially the free kind. To make it easier, I ordered chicken strips for everyone, 2 fruit cups and different drinks. The workers here looked totally exhausted. But no one complained, everyone was all smiles. I thought we might hit up another place after the children's church event. But they forgot their change of clothes! We couldn't let them look like cows for their VBS performance. So the spots came off. But since I sewed them on, we had to pull out all the thread too. I stayed calm but grumpy. Next year, we are using contact paper spots! And hopefully it will not be on the same night at VBS again. And for tomorrow? Krispy Kreme glazed donuts: Buy a dozen glazed, get another for $0.67... hmmm... we'll be there as soon as the HOT sign turns on! Have a Cow! Get a FREE Meal!!! Stay tuned later to see a pix of our fam dressed up! FREE food, even breakfast is included! Chicken fingers for me and waffle fries. Cows are awesome! Just think of how exciting it is to pass by them on road trips. Chance to be corny with your kiddos and hubs! Great way to start the weekend. Last year, we didn't make it to Chick Fil A until 9:30 pm and there was still a crowd and plenty of food left. And everyone was giddy happy before they even got their food! We scrounged last minute supplies and used black socks for ears and lots of tape. It was a memorable experience with lots of laughs. So, yes, please go! Even a couple of black spots on a white t-shirt garners a FREE sandwich. Can't beat that! Thanks Hip2Save for the reminder! Check out the cow costume gallery for inspiration and download a costume starter kit to get started. Thanks Totally Target! What a treat! Hope you get your FREE slurpee today. It's humid here in the River City and perfect time for a nice cool drink. And I just totally got today is July 11... that's 7-11 like the store name! That's why they are doing it today. I'm sure you all knew that already! I got banana and strawberry lemonade mix. There were also lite and sugar-free versions. But I think only the pina-colada flavor will not dye your tongue and lips a funky color. 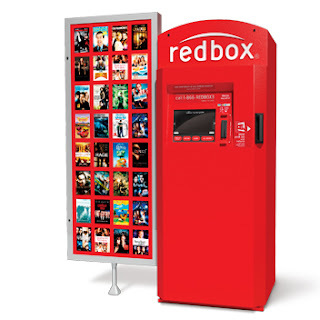 FREE Redbox Code July 10 Only! Tonight only, use this code: LN885GHP for a free Redbox rental. Some of the old codes still work if you haven't used them yet. Codes are also usually good for each credit/debit card. But I'm not sure if they work on Blu-Ray selections. Thanks Money Saving Mom and Freebie Shark! We love Redbox! How about you guys? Here's an idea, pass around the free code. We had a little line going in front of the Redbox. So I tore off the paper and gave it to the next person and asked them to give it to the person behind them. I also thought of taping it to the screen but I would have to remember to bring tape next time! Manufaturer's Coupons From Food Lion's Saving Center! Make sure to stop by Food Lion to print manufacturer's coupons. It's another way to get coupons without wasting printer ink! The MVP Savings Center is a blue version of the CVS Magic Coupon Machine, except it prints our manufacturer's coupons too. Just like at CVS, I make it a point to stop by Food Lion and print out coupons whenever I can. It's convenient that our neighborhood CVS is next to Food Lion! The store coupons are only for that day and are sometimes great for picking up a free bag of rice. But many of the manufacturer coupons have long expiration dates, some are two months! Also, they are usually the same ones that print from coupons.com . None that I have seen say "Do Not Double" either. So, if you have Food Lion stores in the area, keep an eye out for great coupons from the Savings Center. Just this week, I was able to get 4 bags of Chex Mix for $0.50 using coupons from Food Lion. They would have been free, too, if our Kroger stores still doubled coupons. FREE Movies at the Bowtie for Kids! Which one is your favorite? 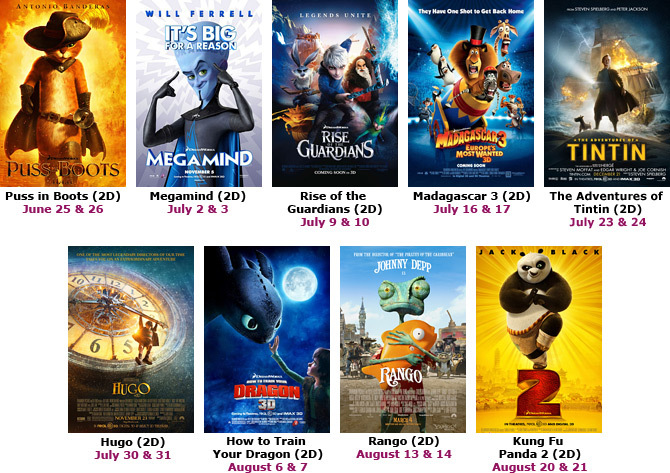 Hard to choose because I like them all, except Rango. Too weird. We love going to the Bowtie Movie Theater. Tuesdays cost $6 for any non-3D movies for Criterion Club members. 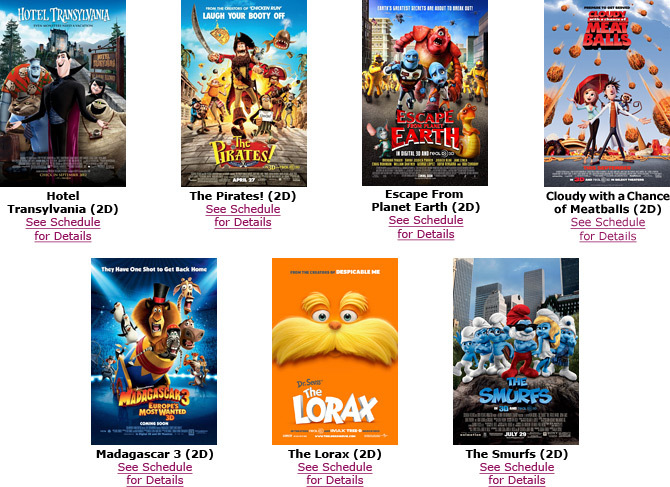 And all summer, the Bowtie offers FREE kids movies Tuesdays and Wednesdays at 10am!!! What a great way to escape the heat. Most of these movies we have only seen on DVD. Seeing them on wide theater screens will be a blast. FREE admission for kids and adults! Frist come first serve only. Make sure to get there early. Sometimes, whole daycares show up to these movie freebies. I mentioned that I grabbed a few cookbooks from different bloggers because I am in desperate need of fresh recipe ideas. 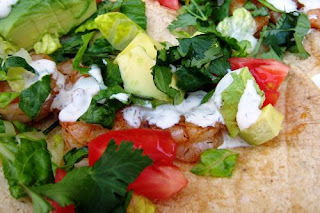 This week, I am trying out Shrimp Tacos from Not You Mother's Make Ahead and Freeze Cookbook. I haven't decided other recipes, but will add them later. If you have a menu plan, why not share it? Link-up to Menu Plan Monday at orgjunkie. My mom used to make a juice drink with cantaloupe. So I made a variation last night with 2 cups cantaloupe, 1 cup strawberries, 1 cup water, 1/2 cup ice. It was sweet enough without even having any sugar added. I think some mint would be a nice addition too. We all loved this so much! Linking recipe to Somewhat Simple's Super Smoothies post! Summer fruits are the best, aren't they? But watermelons and cantaloupes are cumbersome to prepare. I asked the produce guy at Kroger to at least quarter a watermelon for me and he said they couldn't do that. What? Miss my Publix (sobbing). Is there an easy way to manage these giants? I'd like some tips! I also picked up a cantaloupe. When I process these, I use a chef's knife and a smaller steak knife. The seeds are easy enough to scoop out with a spoon. I keep slicing with the chef's knife until the slices are thin wedges. Then I use the smaller steak knife to make it easier for cutting into bite-size pieces.